Which embroidery stitches can you use for flowers? Or leaves? If you are just learning embroidery you might feel there are so many you don't know which ones to chose. I am here to help you. This page introduces some simple stitches that work well for small floral projects. Not only will you find ideas here, but also videos showing how the stitches are formed. You will find links to more stitches in the stitch index. Let's start with the first stitch I learnt as a child, detached chain (also know as lazy daisy stitch). Each detached chain forms a petal shape and we can put them together, with points touching in the center, to form a simple flower. You may like to use three, five or more, detached chains to create the petals, and pop some french knots in the center. In fact these are simple enough that you don't even need a pattern traced onto the fabric! You can also use them by themselves as a complete flower on a stem. Grouped together they can resemble a bunch of tulips. Or why not place them either side of a central stem, to create a sprig of lavender or an ear of corn? You can also place one detached chain inside another larger one. Using different colours can give an interesting effect as shown in the large flower at the bottom of this padded satin stitch initial. For something a little different take a look at my lazy daisy strawberry tutorial. We used French knots for the centre of flowers above, but they can also be used in various ways to create the flowers themselves. One single french knot will work for the smallest flower in a design. Put them together in a ring of four, five or more and you have forget-me-knots or other small flowers. Place them randomly along a stem or branch, and you have blossoms. Mass them together around a stem and you can produce flowers such as bluebells or grape hyacinths. 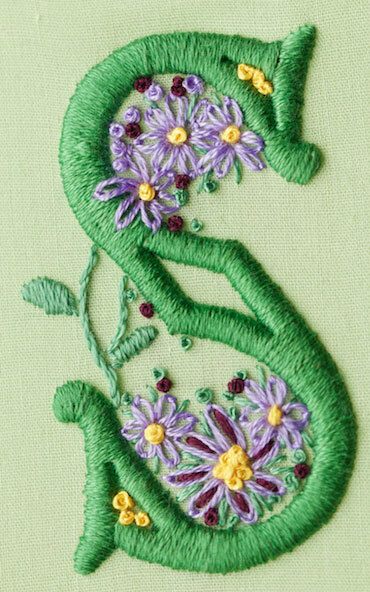 A variation on the normal french knot embroidery stitches are french knots on stalks. Not only do these produce realistic stamens in the center of flowers, but you can also use them for the flower itself. Arranged in a circle with the knots to the outside you end up with a passable representation of an aster. In the photograph, above, we again use detached chains for petals and also for simple leaves, along with stem stitch for, well, the stems of some of our flowers. 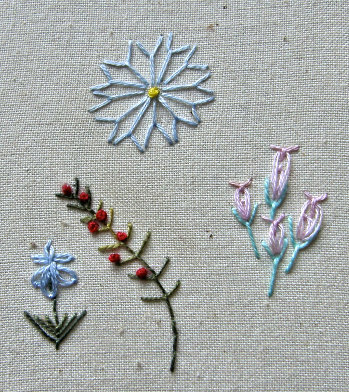 So at this point we have used just three basic embroidery stitches and created a variety of different flowers that can be used in future projects. Let's add another one to our library, this time Fly Stitch. This is commonly used for the greenery in a floral embroidery. It makes wonderful caylx for detached chain rose buds, but did you know that you can pop another fly stitch at the tip? The "tail" of a fly stitch can vary in length from just long enough to tie down the "V" shaped section, to a stalk in itself. 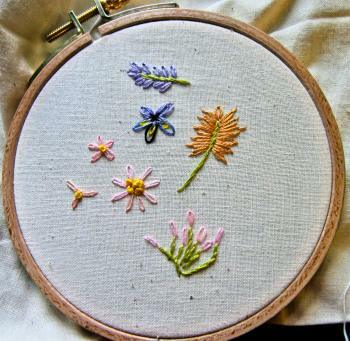 Arrange a number of these long tailed fly stitches in a circle and you have a pretty flower or, if you space the embroidery stitches apart, a dandelion clock, depending on the color of the embroidery floss used. Why not vary the size of the fly stitches themselves and enclose each one in a bigger stitch to create the leaves at the base of a plant. Add a backstitched stem and pop a lazy daisy flower at the top. Or create a spiky branch with berries on it by stitching one atop another for the length of the branch and add french knots, with from one to three wraps, for the berries. ... So now its time to doodle! 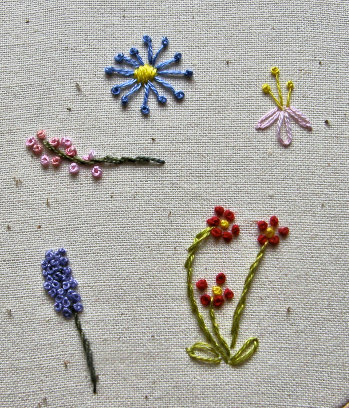 Grab yourself some fabric, needles and threads and have a go at creating your own mini floral embroidery. Use my ideas, or come up with your own. Don't worry about finding a pattern, just start somewhere and scatter your flowers wherever you like. Fill in the gaps with the tiniest flowers and make your own little garden grow on the fabric. But most of all have fun. Your project doesn't need to be large, just give yourself enough room to practice some of these stitches. You are not trying to create a masterpiece, just to have fun while learning. Upload a scan or photo of your sample and tell us about what you added. What stitches did you use, what threads or fibers? Did you like some stitches more than others? Will you use any of them again? Were any of them new to you? You can add a photo and description of your completed challenge on this site by completing the form below. It's easy!